Movies stars and yachts. It's an old tradition. Simon Cowell's quaint little megayacht. This Silicon Valley CEO of Oracle (and billionaire) has salt water in his veins. He's won the America's Cup and done countless offshore races. It doesn't seem like he spends much, if any, time at the office, but I guess if you're the CEO then that's your perogative! Hey kids! Keep your eye on the road there! 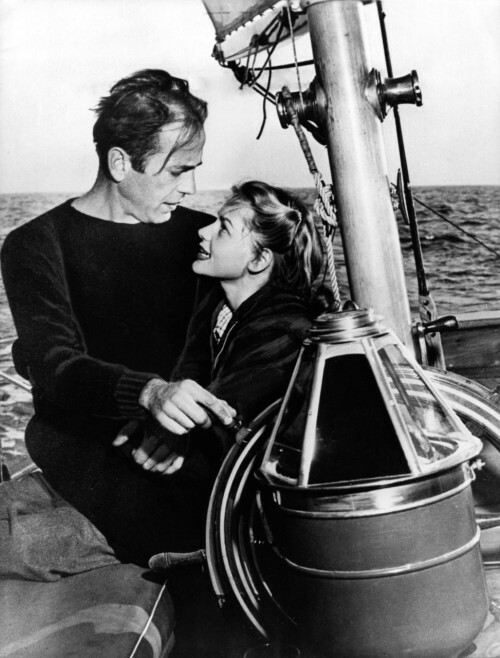 Yep, Bogie and Lauren Bacall were Newport Beach sailors. He raced alot too. In fact, the race from Newport to Catalina Island he used to participate in and win is still going on. It's now named The Bogart Series in his honor. Chris and I won it a couple of years ago aboard Chuck Brewer's "Heartbeat." What a wonderful legacy! 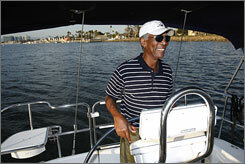 Looks like Morgan Freeman has knocked "Learn to Sail" off of his bucket list! And we know he's already skydived (skydove?) with his pal Jack Nicholson in the movie of the same name. Wonder what's left on that list? You would think not much. "If anything, my bucket list gets longer," Mr. Freeman says. "What keeps you going if you don't have a bucket list?" John, John! There's no SMOKING in sailing! Ah, but we'll forgive you. It was a different time then. 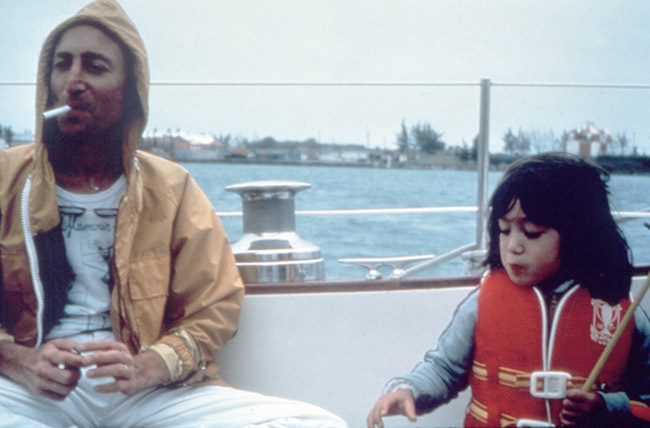 In 1980 he took a 600 mile voyage from Rhode Island to Bermuda to shake off writer's block and get the creative juices flowing. "At first you panic...but once you got out there and start doing all the stuff, you forget your fears and you got high on your performance...there I was at the wheel with the wind and sea lashing out at me. At first I was terrified...but once I accepted the reality of the situation, something greater than me took over and all of a sudden I lost my fear. I actually began to enjoy the experience and I started to shout out old sea shanties in the face of the storm, screaming at the thundering sky." Lennon also compared the experience to when The Beatles were at their peak, saying he felt "centered" and "in tune with the cosmos." Cronkite said: "I love the challenge of the open sea, the business of confronting Mother Nature and learning to live compatibly with her, avoiding if possible her excesses but always being prepared to weather them." Many people are not aware that Ted Turner won the America's Cup back in the day and was actually a famous sailor before he invented the 24 hour news cycle. I'd like to see him battling one on one vs. Dr. Laura. In fact, forget the sailboats. Let's just put 'em in the ring! "I'm a little nervous. A little apprehensive. I think I would be a fool not to be. I'm always a little apprehensive when I go on the sea, because the sea is immensely powerful. I think it will be one of the most challenging things I've ever done." "As a race, it was a complete disaster...it was hard...we lost both of our heads, we ran out of diesel...we couldn't charge our batteries...we ran out of water...our sat phone died, our halyards fouled...it was a crashing disaster in every direction. Yet, at the same time, what struck me was that for all the hardship of it, for everything that went wrong, the entire experience was sublime...it was just beautiful. That's something that's very hard to explain if you've never been out there...it's just hard to explain what is so profound about it. That's why I want to go do it again, to reconnect with that feeling." Regardless of your political affiliation, ya gotta love the cut of JFK's jib. 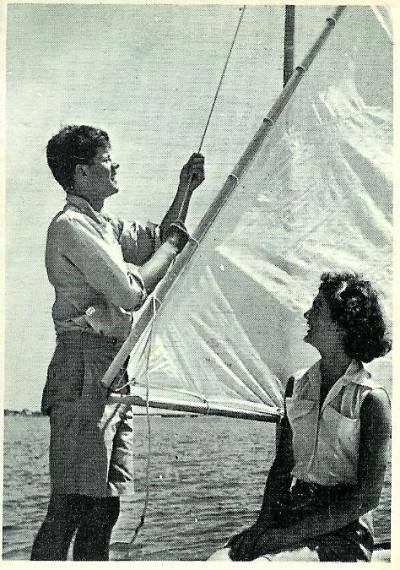 I can really not think of a more quintessential all-American image than these of he and Jackie, newly engaged and very much in love, out for a playful sail. They were innocence and wholesomeness personified, free of the weight of all of the pain and scandal that would follow. Ryan O'Neal,Ted Turner and JFK come to mind as sailors.